Performance metrics can make the difference. Agronomists continually run trials to determine which products best serve any number of production challenges. Trials are run annually in the same crops and in the same geography, and farmers rely on those trial results to determine which products to invest in. And whether it’s seeds or self-propelled sprayers, having good data to make those decisions can be the difference between success and failure. We call these field trials, but in the marketing world, this means of measuring the success of a product or organization over the course of several years is called benchmarking. Benchmarking at its core is a means of enabling comparison by ensuring clear, set standards are in place. Be it the assessment of a product or the function of a service or business, we use it to determine where we are now compared to previous years in productivity, budget, output, and any other litany of variables. And then we flip the switch. We use it to investigate the competition. Not just who did it better, but how, why and through what mechanics did they use? But what are the types and benefits of benchmarking and at what point does it need to reflect the changing dynamics of a company and its industry? 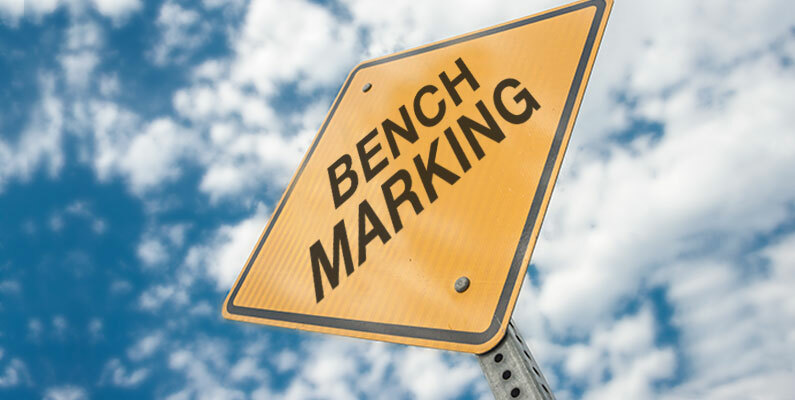 Benchmarking is both informal and formal. Informal is independent, self-reflective, and it explores comparisons that can be found through online research, networking, consultations and casual conversations with colleagues and educators. This is how we check ourselves in our daily lives. Formal benchmarking is done to evaluate product, service and organizational performance for an intended purpose. It’s further broken down to include Performance Benchmarking and Best Practice Benchmarking. Performance Benchmarking explores the accomplishments of companies across several variables. Best Practice Benchmarking looks at other companies and organizations that excel and perform at the top of their game, relative to “World Class” operations. It is formal benchmarking that helps shape best practices and creates better problem-solving strategies. It helps define and construct corporate and organizational goals and objectives, guides the framework toward a competitive position, and initiates the process of improvement. As marketers and brand managers, we’re benchmarking different data than agronomists, but it’s the same principle. As you evaluate the metrics you collect, whether it’s the number of media mentions of your product or the advertising ROI on that product, the objective is to be able to compare it to another ag dealer, explore your role in the marketplace, and utilize this information to make adjustments to your product or service. Consider how you can map your product or service against your competition and use that information to stand out. Benchmarking allows you to do just that – stand out. Think outside the box. The analytical concept of benchmarking reflects on the outliers and the statistical successes, as it should. The theoretical concept of benchmarking looks at those same outliers and successes and asks how we make creative sense of that information. That is where the opportunity lies to develop ideas that are unique, take risks, and continue to build new ambitions. Keep in mind, as your business progresses and as your competition matures, your assessment and the means of assessment also needs to evolve. Your variables are likely to change over time, despite attempts to measure the same benchmarks year after year. That means that you must stay attuned to trends in the marketplace and with your competition, as you continue to find means of comparison. You must also always stay attuned to your business objectives. Vanity metrics are attractive, but quality is what produces success. The old adage is that “the only constant in life is change.” And perhaps one of our greatest abilities is the capacity to measure change. It will always come down to what are the goals, what are the gaps, and what is the difference between the two.